Rich in colour and with the full flavour of Aged Gouda, this cheese is made in Southern Ireland with organic cows milk. Ralph Haslam from Mossfield Farm, County Offaly, puts the unique and complex flavour of his gouda-style cheese down to the local topography. The farm has 240 acres of distinctive grass, produced due to the organic soil, sat above an unusual limestone formation between Birr and the Slieve Blooms. Ralph believes that since converting to organic farming, the soil on his farm has come alive and produces a herby, tangy grass which impacts on the milk from the herd of 70 Friesian cows, and thus on the cheese. The cheese itself is creamy when younger, with the distinct nutty flavour you would expect from Gouda, combined with the herby flavours of the Mossfield grass. 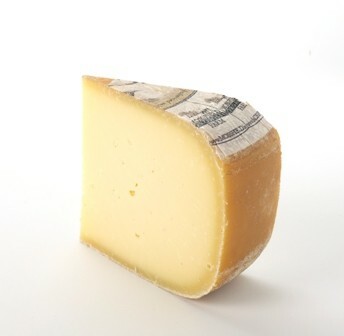 With age, the cheese becomes harder and more crumbly and the flavour stronger and more intense. The team from Mossfield Farm are relatively new to cheese making, having started only in 2004 but managed to pick up a gold medal and two silver medals at the prestigious World Cheese Awards only a year later for their traditional farmhouse Gouda.